An American Coastguardsman from USCGC Spencer (WPG-36) stands behind the conning tower of U-175 as a boarding party attempts to capture the vessel. 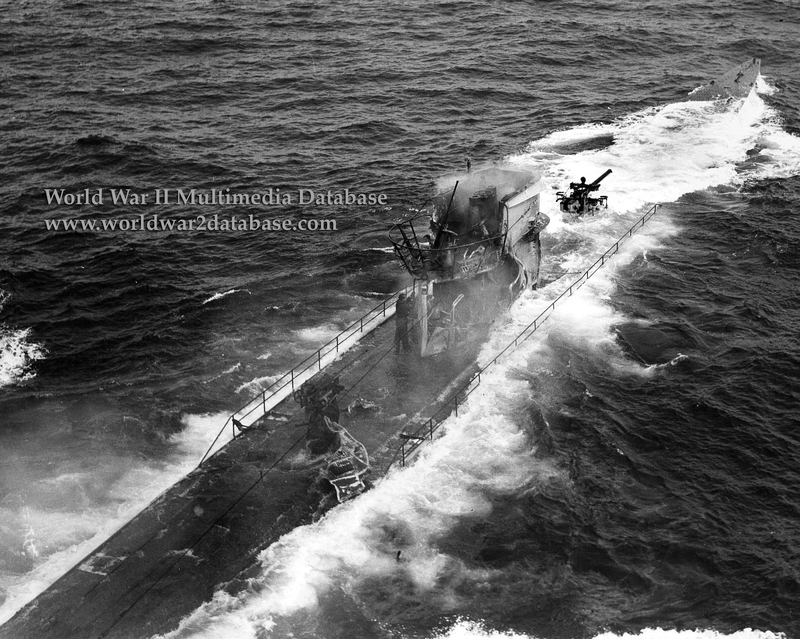 U-175 was part of a wolfpack of five U-Boats sent to intercept Convoy HX-233; U-175 was preparing to attack the steamship G. Harrison Smith when Spencer began her attack by depth charging at 1150 Hours. Joined by USCGC Duane (WPG-33), the two Allied Escorts were searching for U-175 when the sub's conning tower broke the surface at 1238. Spencer, Duane and several merchantmen opened fire on U-175. Korvettenkapitan Heinrich Bruns was dead, and the crew opened the flood valves and abandoned ship. With the motor launch from Spencer shot up by the fusillade, Lieutenant Commander John B. Oren and Lieutenant Ross Bullard led their boarding team to U-175 in a rowboat. The delay probably saved their lives, for while Oren and Bullard's team made it into the sinking submarine's control room, U-175 was sinking by the stern. The team barely had time to look around before they had to leave. The photo, taken from Spencer's bridge, shows a member of the boarding team inspecting the shattered conning tower. Forty-one seamen from U-175 were rescued; thirteen, including Bruns, were killed. Spencer suffered one killed and several wounded. The boarding of U-175 was the first time an enemy vessel had been boarded by the United States since the war of 1812.